The Makkukurosu are onigiri (filled with cream cheese), covered with nori. 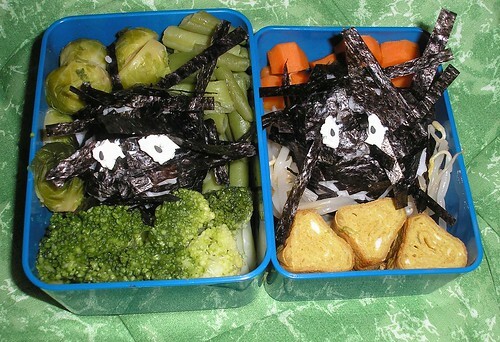 The eyes are made of cream cheese and black sesame. Left tier hast brussel sprouts, green beans and broccoli. Right tier has carrots, bean sprouts and tamagoyaki. The tamagoyaki are made with salt, turmeric and lemon grass.